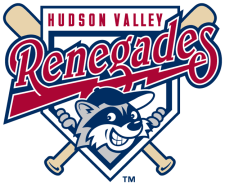 The Hudson Valley Renegades bounced back from their opening day loss by defeating the Aberdeen Iron Birds 6-5 on Saturday night at Ripken Stadium. The Renegades narrowly missed a loss in the bottom of the ninth as the game fell apart due to sloppy play. The Renegades took the lead in the second inning. David Wendt and Brian Bryles delivered back to back singles to lead off the inning. Geno Glynn followed with a walk to load the bases. Robby Price drove home a run with a sac fly that scored Wendt to give them a 1-0 lead. Aberdeen battled back to tie the game in the third. Michael Rooney drew a walk then later scored on an RBI double by LJ Hoes to tie the game 1-1. The game remained tied until the sixth inning when the Renegades struck again. Wendt got things going with a line drive triple to center field. Bryles then drew a walk to give the Renegades runners on the corners. Glynn drove home the go ahead run with an RBI single that scored Wendt and gave the Renegades a 2-1 lead. The Renegades momentum carried over into the seventh inning as they struck for two more runs. Derek Dietrich led off the inning with a walk followed by a single by Burt Reynolds. Nick Schwaner hit into a force out, losing Dietrich at third but moving Reynolds to second. Both runners advanced into scoring position with a passed ball. Steven Tinoco drove home two runs with a two run single to left increasing the Renegades lead to 4-1. Hudson Valley kept producing the runs in pairs, picking up two more in the eighth inning. A two run double by Reynolds scored Bryles and Craige Lyerly to give the Renegades a commanding 6-1 lead. Things got scary for the Renegades in the bottom of the ninth when the Iron Birds struck in a big way. Tyler Kolodny reached base after getting hit by a pitch. Michael Flacco and Austin Rauch then drew walks to load the bases for the Iron Birds. Auburn Donaldson drove home two runs with a single to short that was thrown wildly by shortstop Derek Dietrich. Austin Goolsby drove home another run with a line drive to center field. The final run of the inning came on Dietrich's second error of the inning, allowing Donaldson to score. The Renegades recovered to get the remaining outs and secure the 6-5 win. Julius Dettrich earned the victory, pitching 5 1/3 innings and allowing 1 run on 3 hits with 2 strikeouts and 5 walks. Omar Bencomo followed with 3 innings on the mound, allowing 1 run with 5 strikeouts. Hunter Hill struggled in his 2/3 of an inning, allowing 3 runs on 2 hits with a strikeout and 3 walks. The two clubs wrap up the series on Sunday at Ripken Stadium. Wilmer Amonte will start for the Renegades, opposing Justin Moore for Aberdeen.